Ghoultide Gathering, here I come! Wow, it has been a whirlwind month to say the least! The end of September is nearing, and so I am on my last final stretch to complete this year's collection of Halloween originals. 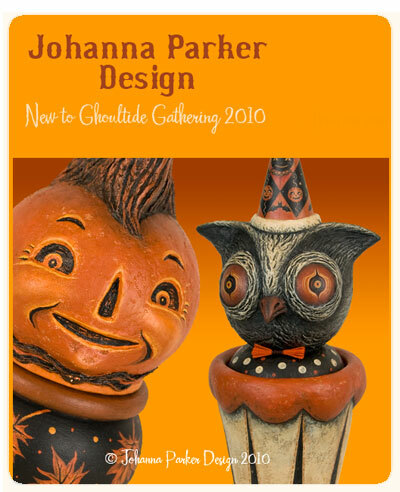 2010 will be my first time to exhibit at the acclaimed Ghoultide Gathering on October 2nd, and I am looking forward to this magical experience! Between now and then, expect to hear very little from me as I work work work to complete all the goodies I have in store! In the meantime, you can read a short Q & A about me and my folk art. Hop on over to the Ghoultide Gathering's Blog and click on my witch to read more! Enjoy, and I look forward to seeing many of you on October 2nd!